Clock on Desktop can be really useful and handy to keep track of time. With changing needs having multiple clocks to track date / time of different locations in the world can be really handy. In case you are using Dual or Multiple Monitors in extended mode, you will have plenty of space on your desktop to place multiple clocks and keep track of multiple locations easily. A Big Monitor with a good resolution also provides plenty of space for various applications and desktop. This post presents a configurable desktop clock that can be used to keep track of date / time of any location in the world and is works on Windows 8, Windows 7, XP, Vista, etc. 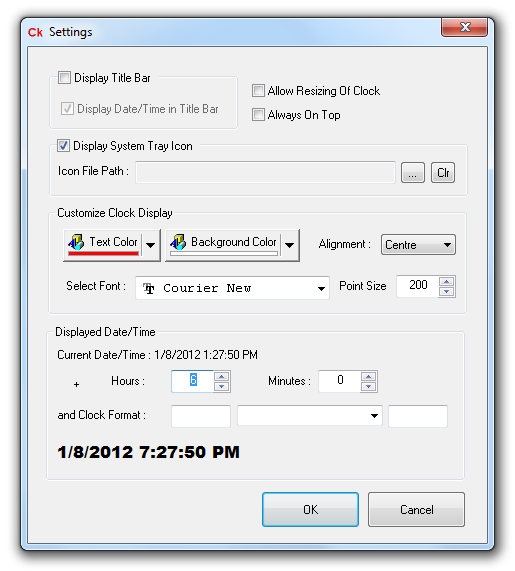 The above screenshot displays what all settings can be configured for the desktop clock. The above screenshot has been taken on Windows 7, 64 bit. Yes it works on 32 bit version of Windows Operating Systems as well. As it is completely free to try out, you can download the trial version of the Desktop Clock right now and give it a try on your desktop or have a look about few of the salient features of this Desktop Clock below. Free to try and download, no registration required for trial download. Works on Windows 8, Windows 7, Windows Vista, Windows XP, Windows 2000, etc. Works on 64 bit and 32 bit versions of Windows. The Desktop Clock can be configured using Settings option. System Tray Icon of the Clock can be right clicked to view the Settings available to configure and Exit the Desktop Clock. The Clock Remembers it’s Location, Size, Styles, Date / Time Offset as configured, Font of the Clock, Format of the Desktop Clock, Font Color, background Color of the Desktop Clock and all other parameters configurable from the Settings of the Desktop Clock as displayed above. The Desktop Clock presented above is a small software utility that can be used to display a small digital desktop clock. The Clock remembers its attributes and can be launched from a Desktop Shortcut or Programs Menu. A System Tray Menu is displayed when the Clock is running. Desktop Clock for Windows can be launched multiple times and can have multiple instances and all of them remember their attributes. Yes the Software Applications presented work fine on Windows 8 apart from current Windows versions such as Windows 7, Vista, etc and are free to try out.